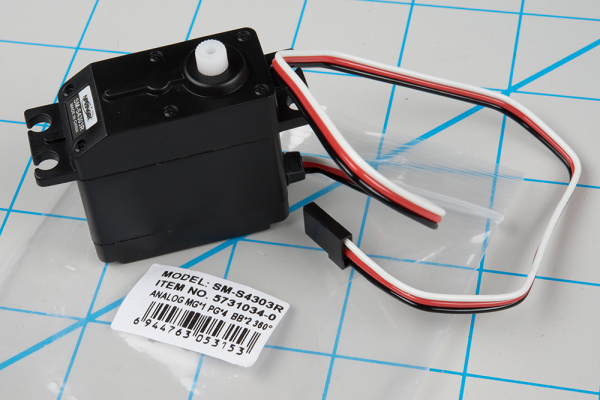 Servo motors are an easy way to add motion to your electronics projects. Originally used in remote-controlled cars and airplanes, they now crop up in all sorts of other applications. 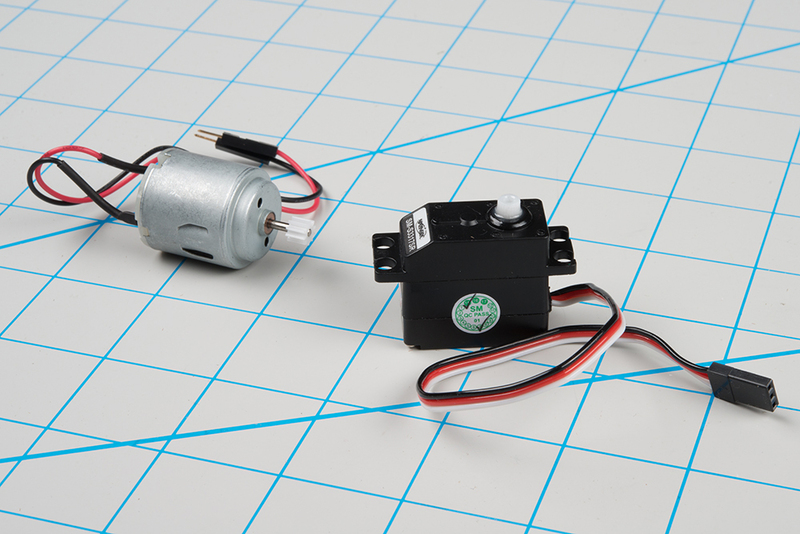 They're useful because you can precisely control the positioning of these motors. Instruct them where to point, and they'll do it for you. An ordinary DC motor has two hookup wires and simply turns continuously when power is applied. If you want it to spin in the opposite direction, you'll need to reverse the power. And if you want to know how far it has turned, you'll need to devise a way to measure that. In contrast, you instruct a servomotor where to turn using carefully-timed pulses. 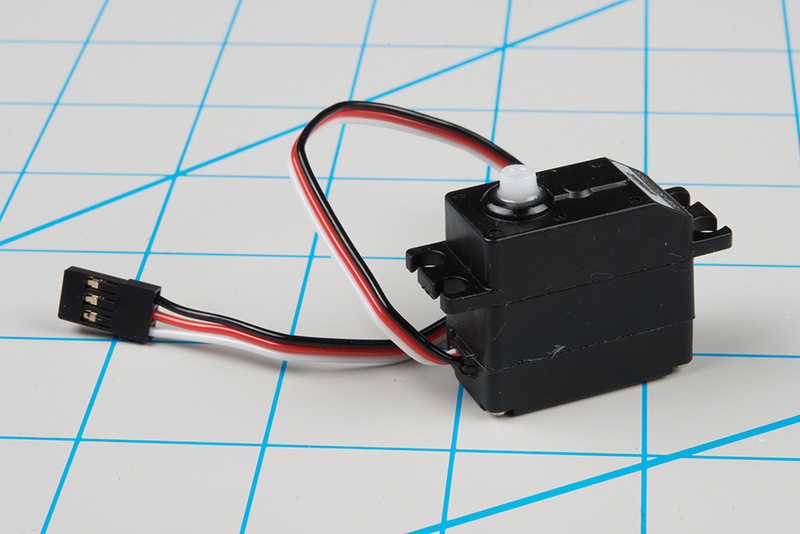 The servo has three wires: power, ground, plus a third wire to carry the command pulses. In the most generic sense, a “servomechanism” (servo for short) is a device that uses feedback to achieve the desired result. Feedback control is used in many different disciplines, including speed, position, and temperature. 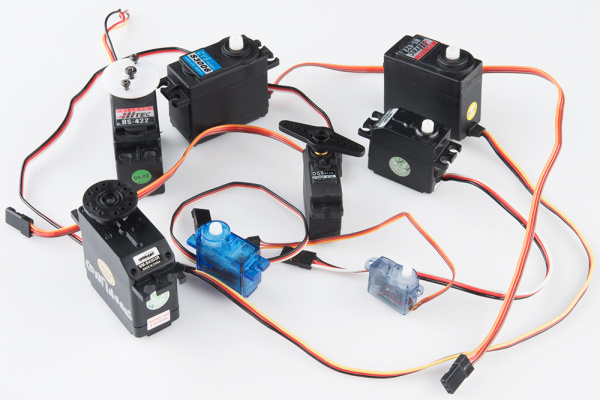 RC servos are reasonably standardized - they are all a similar shape, with mounting flanges at each end, available in graduated sizes, from "ultra-nano" to "giant". Servos often come with multiple attachments, such as wheels or levers, known as “horns”, than can be attached to the shaft, to fit the device they are operating. The connector is a female, 3-pin, 0.1" pitch header. One thing that can be confusing is that the wiring color code isn't always consistent -- there are several color codes at play. The good news is that the pins are usually in the same order, just that the colors are different. Heads up! If you're in doubt about your color scheme, check the documentation -- don't plug it in backwards! Common servos rotate over a range of 90° as the pulses vary between 1 and 2 mSec -- they should be at the center of their mechanical range when the pulse is 1.5 mSec. In RC vehicles, the nominal battery voltage is 4.8V. It will be somewhat higher after a charge, and it will droop as the batteries discharge. 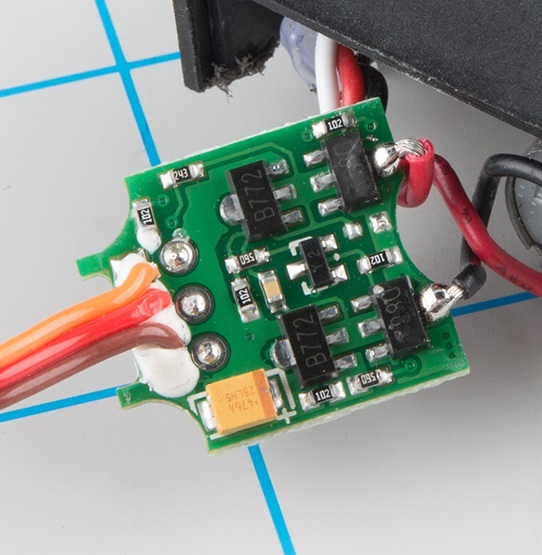 As the voltage drops, the available torque also drops -- if you've driven RC vehicles, you're no doubt familiar with the loss of control that occurs as the batteries get weaker. It starts to feel sluggish just before it dies. If you're not using batteries, the 5VDC available from a garden variety power supply is a good option. If you're using an Arduino or other microcontroller (such as the SparkFun Servo Trigger) to control your motor, the absolute maximum supply voltage that should be applied is 5.5 VDC. Regardless of how you're powering them, it's worth noting that the current consumed by the motor increases as the mechanical loading increases. A small servo with nothing attached to the shaft might draw 10 mA, while a large one turning a heavy lever might draw an Ampere or more! If your power supply isn't up to the task, a straining or stalled servo can cause the supply to sag, which may have other unpredictable repercussions, such as causing microcontrollers to reset. 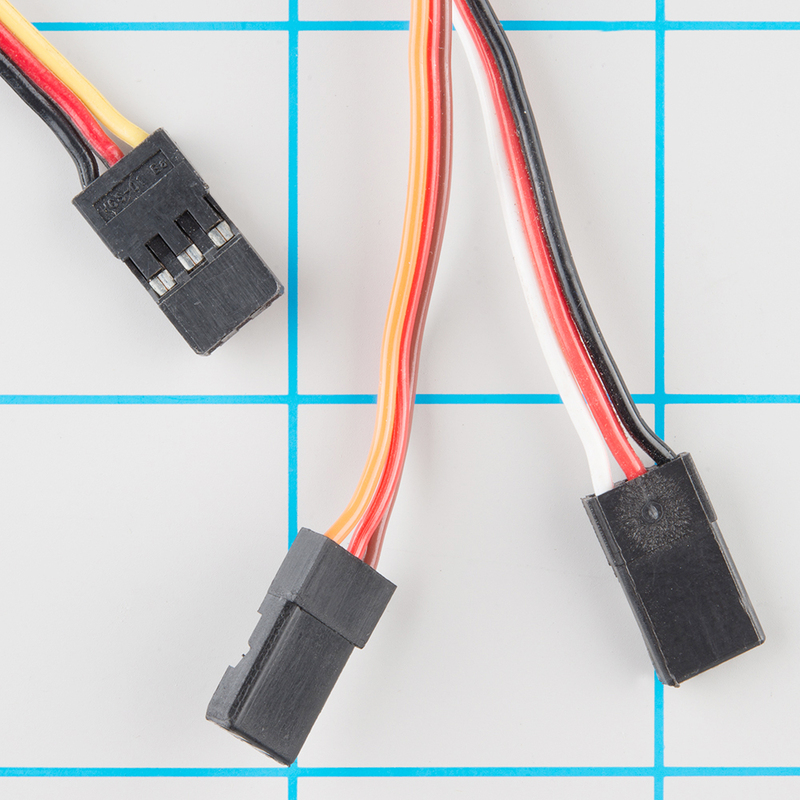 Additionally, if you've got multiple servos, or in applications where the motors are moving non-trivial loads, it’s best to use heavy gauge wires and give each servo a direct connection to the power supply, rather than daisy-chaining power from one to the next. This configuration is commonly known as “star power.” If one servo causes the power rail to droop, it's less likely to effect the others when each has a direct connection. 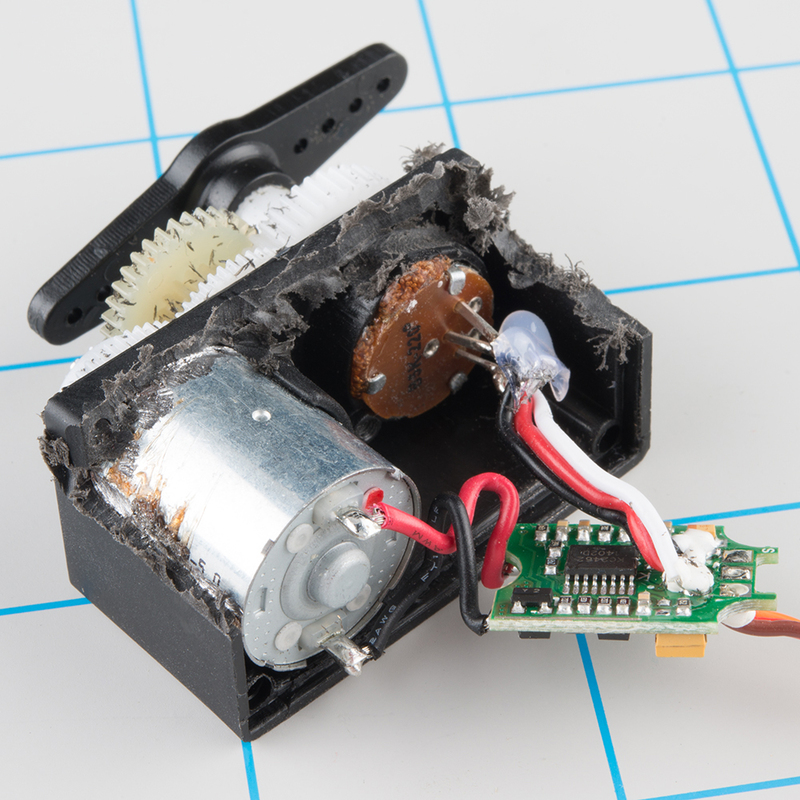 Here are the insides of a servo that's been dissected. 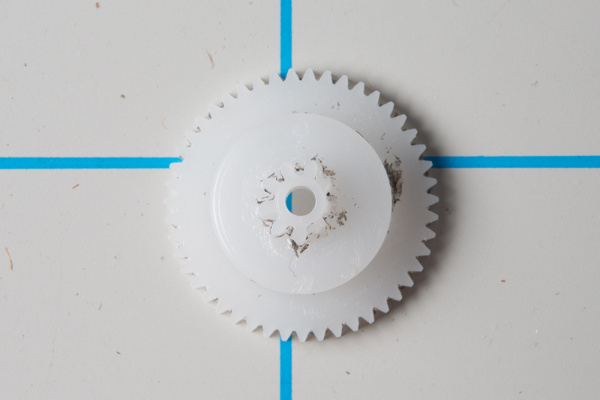 You can see the gears, DC motor, position potentiometer, and a small PCB. The PCB has a chip on one side, possibly a small microcontroller or specialized servo IC. 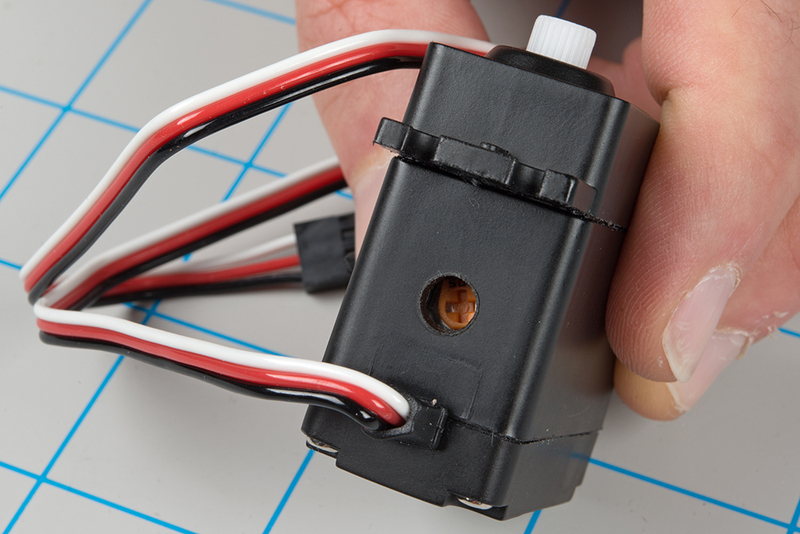 When you're shopping for servos for your project, there are several parameters that you'll want to keep in mind. Be warned that there is a risk -- this expanded range of motion isn't universal. Some servos are mechanically limited to 90° rotation. Attempting to drive them beyond their limits can cause damage, such as stripped gears. The servo that we see dismantled here suffered exactly that fate. Look carefully, and you'll notice the "360°" mark on the packaging. Rather than controlling position, the continuous rotation servo translates the 20 mSec pulse-train signal into the rotational speed and direction of the shaft. Otherwise, they're very similar to regular RC servos -- they use the same power supply, control signals, 3-pin connector, and are available in the same sizes as RC servos. The overall speed is relatively low -- around 60 RPM is a common maximum rate -- if you need higher rotation speed, servos aren't the best fit -- DC gearmotors or brushless DC motors are more likely candidates, but they aren't directly compatible with servo control signals. On closer inspection, continuous rotation servos have one small difference from regular servos: they usually have a "nulling" trimpot, used to adjust their response to the control signal. It's typically set so that a 1.5 mSec pulse stops the motor. Shorter pulses will cause it to turn counterclockwise, and longer pulses cause it to turn clockwise. The pulse-controlled servos we're discussing here are analog. There are also digitally-controlled servos that use a high-speed pulse train, and have a serial communication interface that allows more detailed configuration, typically with parameters that are tailored to RC vehicles. Note the missing tooth at about 3:00 o'clock on the inner gear! RC vehicles are controlled with a transmitter unit -- the box with the joysticks and antenna. 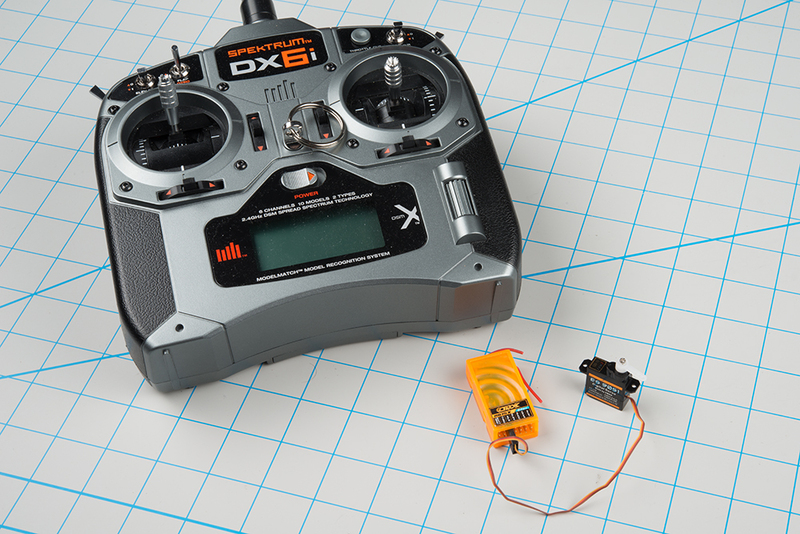 The transmitter sends control information to receiver modules (the orange box shown above), which connect to the servo motors. When the sticks on the transmitter are moved, the receiver generates corresponding pulses, instructing the motors to move. Because they move on command, servo motors are an easy way to add motion to any project. If you're working with an Arduino-compatible platform, the Arduino servo library provides a ready-to-go servo pulse generation solution. To build this example, you'll need the following materials. In particular, notice that power to the servo motor is supplied from the VIN pin, which bypasses the onboard regulator. 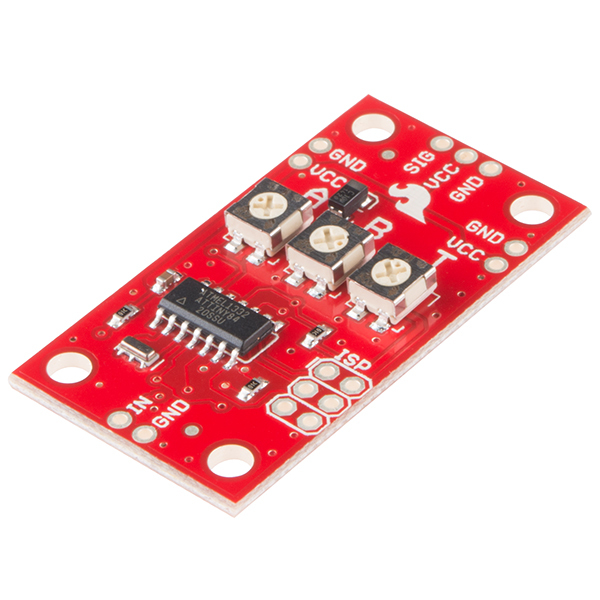 The onboard regulator in insufficient to drive anything but the smallest of servos. You'll also notice that the project is powered with a 5V wall adapter. On the author's workbench, performance was marginal when the board was powered by the USB port. If things don't seem to be quite right, please look through the troubleshooting section. Having programmed a servo example from scratch in the last section, there's another way to deploy servos that doesn't require any programming. 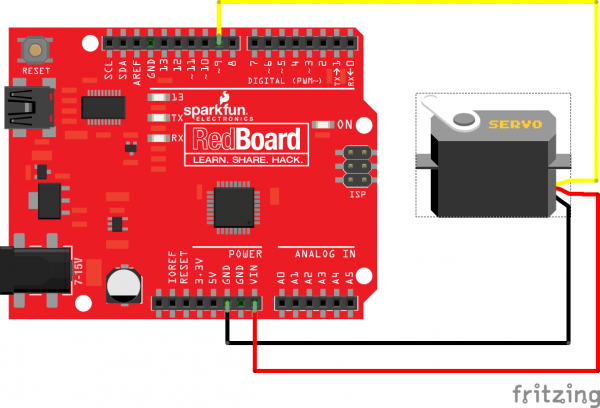 The SparkFun Servo Trigger is a small board dedicated to driving hobby servos. It has trimpots that allow you to set the servo positions and jump between the positions by actuating a switch. It is available in standard and continuous rotation versions. For more detailed information about the Servo Triggers, consult their respective hookup guides. Regardless of how you're driving it, servos sometimes require a little extra attention to get working. Here are a few troubleshooting tips. 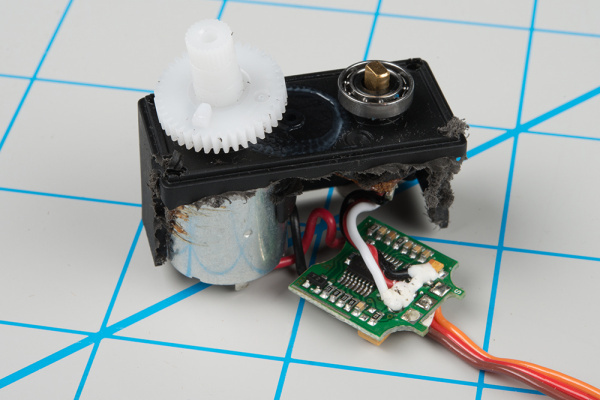 When the power supply isn't up to the task, servos behave poorly. They'll move more slowly than a properly powered servo. Underpowered servos are prone to hunting, where they don't move cleanly to the desired position, but instead move back and forth near that position. They might also audibly hum, or repeatedly reset. If your power LEDs flicker when you try to actuate the servo, you're in risky territory! 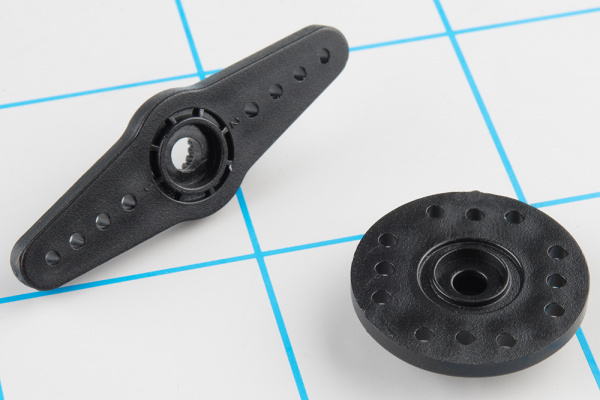 If this will affect your project, look for a servo that is specified to provide 180° of rotation. Also, note that the Servo library's attach() command allows you to fine-tune each servo's min and max position, to help avoid driving it beyond the limits. The Wikipedia article on [Radio control Servos](https://en.wikipedia.org/wiki/Servo_(radio_control) ) contains more more detailed information and history of servos.